Here in America, we are constantly striving to find new ways to consume Oreos for every single meal and in place of actual drinks, and perhaps, one day, we'll be able to breathe them instead of air. But until then, we've got these new double-stuffed Oreo Jell-O shots from A Beautiful Mess, which -- in place of the usual cream filling -- have cake batter- and white chocolate-flavored boozy Jell-O. We guess you could inhale these. But only figuratively. Recipe creator Laura Gummerman made the Jell-O shots by combining milk, cake-flavored vodka, white chocolate liqueur, and gelatin, chilling the mixture until it set, and cutting the resulting Jell-O into precisely Oreo-sized rounds. 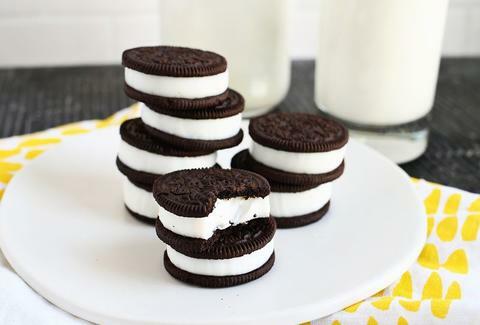 Then, they're sandwiched between two halves of a scraped-out Oreo (you can either discard the cream filling or -- aw, who are we kidding, just eat the damn stuff!) and served alongside more milk, because, DUH. You can find the full recipe at A Beautiful Mess, right here. Adam Lapetina is a Food/Drink staff writer for Thrillist, and only has Oreos in his pantry. Read his musings at @adamlapetina.